The idea of faith in the sense of belief has been dominating Western culture and its definition of religion since centuries. Abrahamic religions are belief systems, which are based on belief. Blind belief is considered to be a virtue and belief as such is all that is required of anyone following those religions. This has lead to the fact that using one’s own intellectual competence in spiritual matters has been viewed with suspicion by clerical authorities; the results of reasoning need to be kept within the limits set by the belief in question. This is how the Western shism between philosophy and religion and later between science and religion has come about. It had to come about: Belief is exclusive to the usage of one’s own intellect. Only after the West had started to question the authority of Abrahamic belief systems it started to be what it is now: a highly evolved industrial and scientific culture. Up to this day a deep mistrust to anything based on faith alone has remained within the Western mind. So it is not surprising that Western seekers tend to feel that they have to exclude from their spiritual pursuit what they consider to be faith. This makes them the ideal aspirants for eastern spirituality, especially for Advaita Vedanta. It cannot be stressed enough that Advaita Vedanta will never ever ask the aspirant to surrender his/her own mental capacities to any kind of belief. In fact, Advaita Vedanta needs and relies on those very intellectual capacities, it puts a lot of effort into sharpening and refining the intellect (buddhi) as it is the very instrument used to discover who I truly am. If Westerners are the ideal aspirants for Advaita Vedanta, how come so few are interested in it? I have addressed some of the obstacles in my last blog (http://advaita-academy.org/blogs/Sitara/Access-of-Western-Advaitins-to-the-traditional-teaching-of-Advaita-Vedanta-and-vice-versa.ashx). There is one more which has to do with this blog’s topic “faith”. As for Western seekers faith and belief are inseparably linked, they tend to throw the baby with the bathwater: the bathwater being belief, the baby being trust. In other words: trust is the casualty of denying faith a place in their spiritual life. I know almost nothing about Sanskrit but I do know something about the minds of Western seekers, especially of Europeans. That’s why I unreservedly advocate translating shraddha with trust, not with faith. In the Western mind faith becomes belief. Nobody studying Vedanta needs to believe anything, but trust is indispensable. If I cannot trust that it is possible to find what I am looking for and that there are means to help me finding it, I might as well give up the search altogether. Trust includes usage of one’s mental capacities, never excludes it. Trust includes absolute openness with respect to the outcome, i.e. anything can be regarded as a working hypothesis that I place my trust in until it proves to be incorrect. Interestingly both of these explanations perfectly accommodate Western people’s need to remain free while searching. For an Indian seeker they may be taken for granted. For Westerners they have to be pointed out, especially if they find themselves in front of a religious teacher who makes an ideal surface upon which one’s reservations against belief can be projected. When explaining shraddha Vedanta teachers usually mention that it involves faith/trust in the scriptures, in the teacher and in god. In an earlier blog (http://advaita-academy.org/blogs/Sitara.ashx?Y=2011&M=May) I defined shraddha as the “ability to trust that it is possible to discover what is searched for – with the help of Guru, scriptures and through the grace of the natural law and order (Ishvara)“. The Western seeker will be able to handle his/her reservations towards Guru and scriptures when having the above two explanations in mind. Yet, a BIG obstacle arises when god comes into play. This is because – however much you call it “trust” – god is inseparably linked with “belief”, so as soon as god is involved, “trust” inevitably becomes “belief” again. As Christianity is the dominant one and the one I know best, I will describe the ways in which it tends to strangle the Western seeker’s ability to embrace Shraddha. The Christian god is male, has three different aspects (Father, Son, Holy Ghost), is forever different from man and has to be believed in; with him comes a whole set of doctrines, which also have to be believed in and a whole set of rules, which have to be followed. Man being god’s creation was, initially, inherently good. Unfortunately something went wrong in the very beginning when the woman – who was created as man’s companion –decided to eat from the “Tree of Knowledge”. Adam and Eve were allowed to eat the fruits of every tree in paradise, except for this one! In Vedanta’s paradise those fruits would have been served to them by angels on a silver platter! 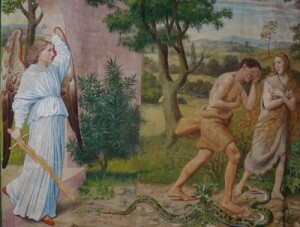 Anyway, because Eve went against god’s order she was expelled – along with her husband – from paradise forever. From then on humans (and for some reason all other life forms too) have to live on earth, which is considered a place of exile, a punishment, and not a blessing as per Advaita Vedanta. Since Eve’s transgression every human being is thought to be inherently evil and prone to end in hell. But god is considered to be merciful so people have got the chance to earn god’s grace. How? By believing in him and in everything he says (all written down in the holy book) and following his orders. I have to point out here: believe means “do not think for yourself”. It also does not differentiate between people of high intellectual abilities and people who are yet unable to think for themselves. No, all of them have to become sheep, follow the good shepherd Jesus … that way you have the opportunity to be saved from your own evil nature and after death enter into something like paradise again. Not enough with this, the most tricky thing is that every human being is granted only one life. If he fails in this one no other chance is given to him ever. Moreover, failure means that he is going to be condemned for eternity, lost forever in hell. No wonder that Christian countries are almost obsessed with trying to be (or at least pretend to be) do-gooders. Anyone growing up in a society impregnated with such kind of beliefs cannot but carry within him a deep sense of shame, guilt and fear which has to be constantly kept in check. It is the fear of an almighty god who sets up non-understandable rules (do not eat from the tree of knowledge), unattainable goals (keep your insights within the realms of your believes) and merciless punishments (eternal hell). Being aware of this, one cannot but expect every intelligent Western seeker to dismiss any idea of god. That’s why, when speaking to Westerners, it is unwise to call Ishvara god. Westerners will necessarily understand god as something fitting the above description. But such a god does not exist in Advaita Vedanta; as far as I know he does not even exist in all of Hinduism. Yet Westerners do not know that. When they learn that Advaita Vedanta is associated with Hinduism they cannot but feel apprehensive. In their culture there is only one god. But in Hinduism there many, some looking suspiciously sweet, but others seem to be even worse than the god of their own culture that they are so happy to leave behind. Who would be interested in something that has links to a religion with millions of them?! Western seekers want to escape their own religious heritage and because of their god-trauma prefer religions and spiritual directions, which do not take god into account at all, such as Buddhism and Western Advaita. In Advaita Vedanta we have the concept of Ishvara; it has to be introduced to Western seekers with great sensitivity; many Vedantins have no problem to personify Ishvara, whereas Western seekers will have lots of problems with a personified god. Luckily, understanding what Ishvara is, those problems will dissolve: Ishvara is the totality of all natural laws and orders and their seamless interlocking. When they manifest, the universe with its multitude of shapes and colors appears. In that sense the universe is Ishvara manifest. This is god in Vedantic terms. No Western seeker will have problems accepting such a god. He, who actually is a “he” as much as a “she”, places no threat. After all, who is to blame for the law of gravity? If someone jumps from the third floor of a building he either intends to die or he is not in his senses. But in no way he would be able to say “God punished me by breaking all my bones after I had jumped down that building.” Breaking his bones was the result of his action that, given the natural law and order, had to be expected (being optimistic that is). After having written about faith and god I came to realize how translating Sanskrit terms this way or that way can make a whole lot of difference in respect as to whether Westerners become interested in or repulsed by Advaita Vedanta. In the translation of the Bhagavad Gita by Swami Dayananada I discovered one other example. In chapter 2 we find the word “sin” twice. After everything I said above I probably do not have to explain that, just like “faith” or “god”, it is one of those words prone to cause misunderstandings. Actually Christian terminology should be avoided completely when translating Vedantic texts (especially negative words) – at least if you intend to reach a modern Western audience. Should such words appear somewhere they always have to be explained in their Vedantic context. Unfortunately the Sanskrit word pApa now is standardly translated as “sin”. In order to give Westerners a more suitable understanding instead of “sin” I suggest the translation “bad karma” with a footnote briefly explaining what this entails. So pApam avapsyasi would become “You will gain only bad karma” – instead of “you will gain only sin”. To the Western mind “gaining sin” does not make sense anyway. Sin can be committed but it cannot be gained. What you can gain is another penalty point on god’s list that will haul you further in the direction of eternal hell. But you cannot gain sin. This entry was posted in Sitara, Topic of the month and tagged abrahamic religions, belief, belief system, Christianity, faith, God, ishvara, Knowledge, papa, shraddha, sin, traditional advaita, tree of knowledge, trust, understanding, western advaita by Sitara. Bookmark the permalink. As for Western seekers faith and belief are inseparably linked, they tend to throw the baby with the bathwater: the bathwater being belief, the baby being trust. I think there’s also the fact that relatively few people have even heard of Advaita Vedanta, despite being well aware of the existence of Hinduism. It seems to me that a lot of people assume that Hinduism is mere polytheism and “idol worship,” and it appears that not a few think of ISKON when Hinduism is mentioned. There’s also the matter of other nondualistic systems/methods in addition to Advaita Vedanta, including Zen Buddhism, esoteric Christianity (in the vein of Meister Eckhart), Taoism, etc., which stem from exoteric traditions that are obviously much better established (and thus more familiar) than Hinduism outside of India. It’s no mystery that seekers would turn to those traditions first. Others, perhaps most notably Eckhart Tolle, opt for an eclectic approach, drawing from multiple streams across the entire spectrum of major religions. But such a god does not exist in Advaita Vedanta; as far as I know he does not even exist in all of Hinduism. Such a God probably exists in Dvaita Vedanta. As far as I know, that’s the only school in Hinduism that preaches a doctrine of eternal damnation. Ishvara is the totality of all natural laws and orders and their seamless interlocking. As someone with a Western (id est Christian) background, I appreciate this article. I hope to see comparisions between Advaita and other nondualistic systems, especially Tibetan Dzogchen, Zen Buddhism, and Kashmir Shaivism. (These essays are adressing people who do not know much about advaita vedanta so please do not expect a lot of sophistication). As far as comparisions between Advaita and other nondualistic systems are concerned I am not able to deliver these because I do not know enough about them. Also I don’t think that this site would be the right place to discuss them. I guess these approaches have their own sites. Advaitism holds that when human beings think of Brahman, the Supreme Cosmic Spirit is projected upon the limited, finite human mind and appears as Ishvara. Therefore, the mind projects human attributes, such as personality, motherhood, and fatherhood on the Supreme Being. An interesting metaphor is that when the “reflection” of the Cosmic Spirit falls upon the mirror of Maya (Māyā; the principle of illusion, which binds the mind), it appears as the Supreme Lord. Brahman is not thought to have such attributes in the true sense. However it may be helpful to project such attributes onto Brahman. So any personality that Ishvara seems to have is a human projection/superimposition. Perhaps a better way of putting it is that Ishvara is Brahman viewed through human lenses. Ishvara is pure intelligence because the totality of natural law and order is pure intelligence. I may have been thinking in binary terms: that the choice was between an intelligent being and non-intelligent physical forces. I’m not used to thinking of pure intelligence as something that stands on its own. That last part could’ve been worded better. I meant that I wasn’t used to thinking of pure intelligence as something impersonal, or transcending personhood. Though I cannot immediately place my finger on the exact reference, my understanding is that we have a different word for the set of natural laws. That word is “niyati” and not Ishwara. “niyati” is supposed to be part of the first thought with which the ‘creation’ starts i.e. the One to many manifestation by the hiraNyagarbha. Some describe ‘niyati’ as the power of Ishwara. Excellent post and clarifications (mostly for Westerners) by Sitara. Many of us have experienced such divergences, hence misunderstandings, between the teaching of Advaita Vedanta and the Western Christian tradition. “(P) Īśvara is pure limitless existence-consciousness together with its intrinsic potential for manifestation (māyā)”. (M) Right, it represents all cosmic laws and, clearly, is not the stern, authoritarian God of Old Testament Christianity, or the God of Islam, who appears as more generous and loving. Jesus, on the other hand, can be said to represent the logos (buddhi) of Neo-Platonism and Gnostic Christianity. Is Ishvara not impersonal, unlike Krishna and Rama? One difference is that God’s laws are decrees and ordinances (commands), whereas Ishvara’s laws are cosmic and impersonal; “it is what it is”, as you say; obedience has a different tinge in either case.